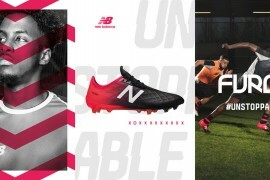 After a warm reception for the new Away Kit, adidas are hoping to make it two change strips on the bounce for the Anfield club with this stunning new Liverpool 3rd Shirt! The new Liverpool FC 3rd Shirt takes its design inspiration from the classic tracksuit tops worn by the infamous LFC teams of the mid 1980˘, incorporating the diagonal stripe across the front of the shirt. 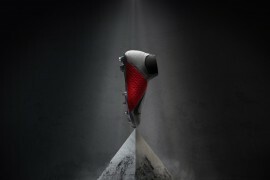 Drawing from history and tradition, the new kit showcases a stylish modern twist. The inclusion of cyan blue in the shirt design dates back to Liverpool˘ first home kit worn almost 120 years ago which incorporated alternate white and blue halves Ĺ› it wasn˘€žËt until Bill Shankly became manager that' the home kit' became completely red, in 1964. The cyan blue is used throughout the kit and incorporated into the design through the iconic adidas three stripes across the shoulders and the shirt sponsor. The Liverpool FC 3rd Shirt‘s main design features diagonal stripes in black and cyan blue over the right shoulder and continuing around the trim of the sleeve to create a modern, stylish look whilst giving a nostalgic nod to the club˘ illustrious past. A closer look at the Liverpool FC 3rd Shirt reveals further subtle design features including a diagonal, tonal emboss running through the fabric. 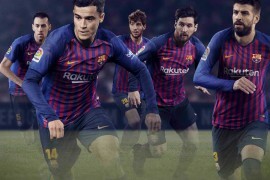 -The shirts also feature adidas ClimaCool technology, a mixture of heat and moisture controlling materials, ventilation channels and 3D fabrics which improve air flow to the skin in the key heat zones. oh my god! Liverpool have got a nice kit! “stabilizing and focusing the musclesâ€™ energy” – What the hell is that supposed to mean? Is this material stitched together by elves from beyond the magic rainbow? great shirt for the peoples club. Not keen on the arms of the shirt. 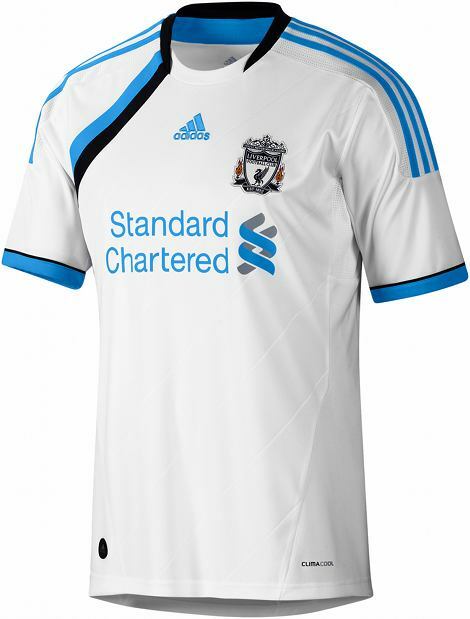 The design is cool, though not very Liverpool. 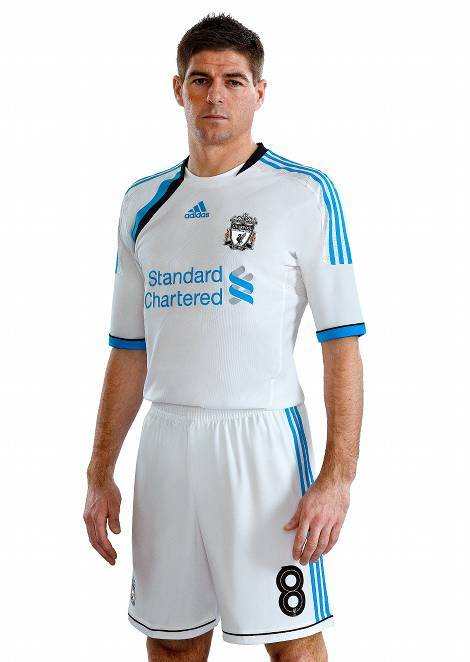 Evertonians will be happy that Liverpool will be in white and blue….